The one good thing about summer being over? 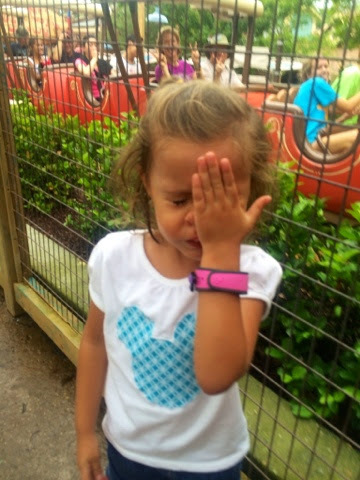 The blackout dates for our Disney seasonal passes are over! We went to the Magic Kingdom the first weekend we could. 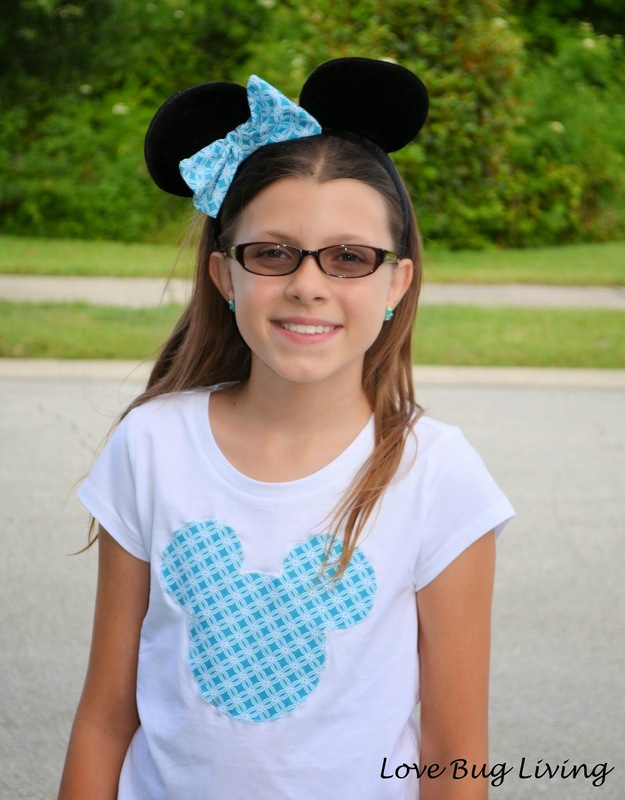 What better way to bust out our new Mickey Ears T's! This is our first year as season pass holders, and it is definitely one of the perks of living so close to the parks. We have definitely enjoyed our time at the parks and have gone as often as we can. Although, I was okay with having the blackout dates over the summer. It helped lower the price of the tickets and I definitely didn't miss the heat and crowds that can be ridiculous over the summer. 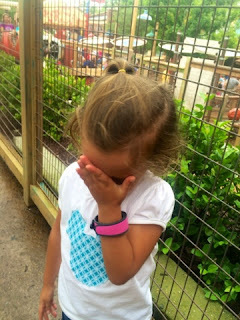 My youngest has been talking about going on Goofy's Barnstormer all summer. It is a smaller roller coaster geared towards kids. 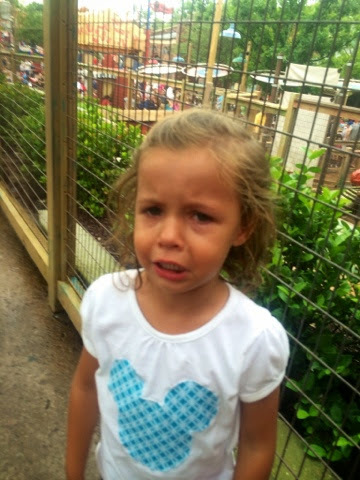 She had ridden it once and definitely didn't like it. I guess she was just ready to give it another try. She was all excited as the ride started, but that excitement quickly turned to tears. Guess it wasn't all she was expecting. 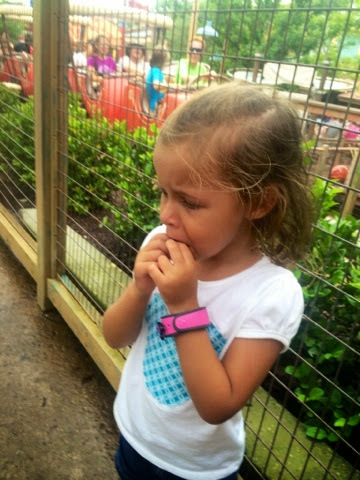 She went through a range of emotions, but told us that it was too scary and she didn't like it. 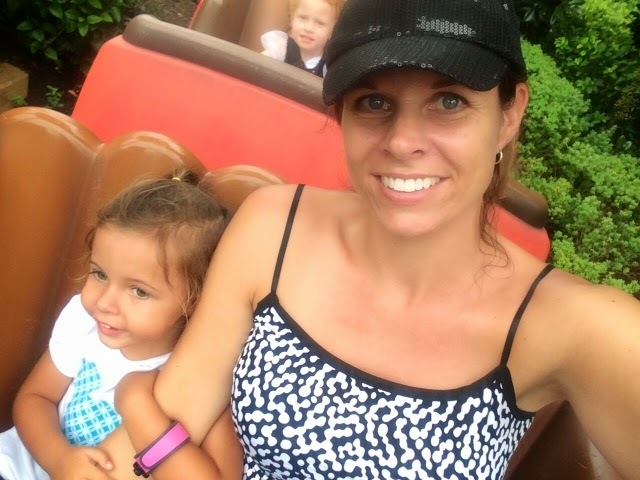 I guess three year olds have a short memory, because after a quick trip on the train, she wanted to ride Barnstormer again! We decided to save that for another day. What better way to celebrate the end of our Disney blackout, than to debut our new Mickey Ears T-shirts. I have noticed that quite a few families are wearing matching shirts and cute Disney themed outfits. My first thought was, "I can make those!" My opportunity to prove it came when my oldest had a Disney themed chorus performance at school. They were asked to wear any Disney clothes they had. 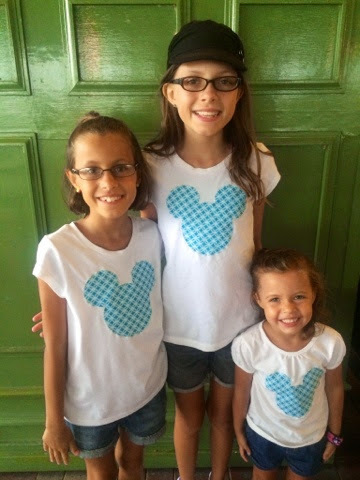 I decided to make the Mickey T's for each of my girls so they could dress alike when we went to the parks. 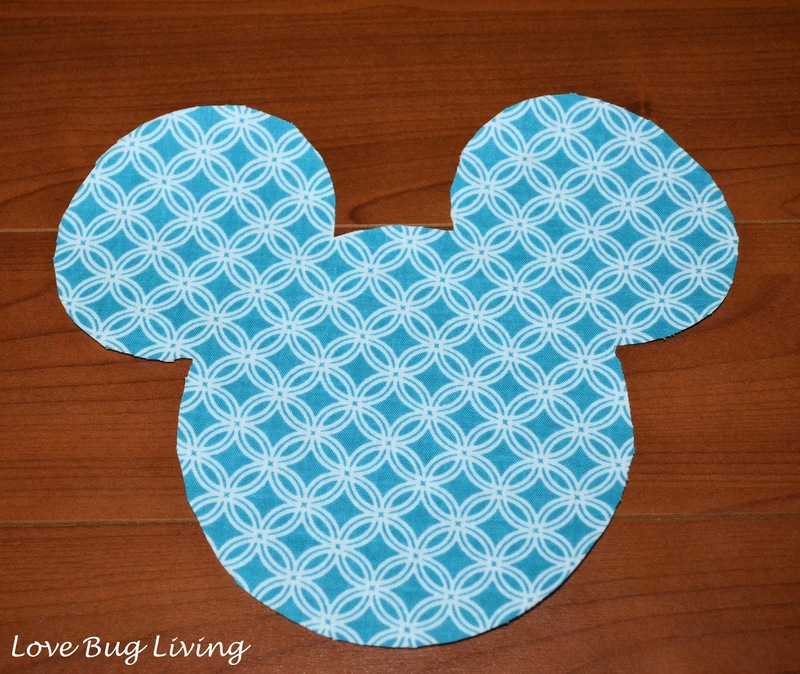 To appliqué the ears, I simply found a Mickey ears pattern online and printed it out. I used iron-on fusible web to attach the ears to my t-shirt. 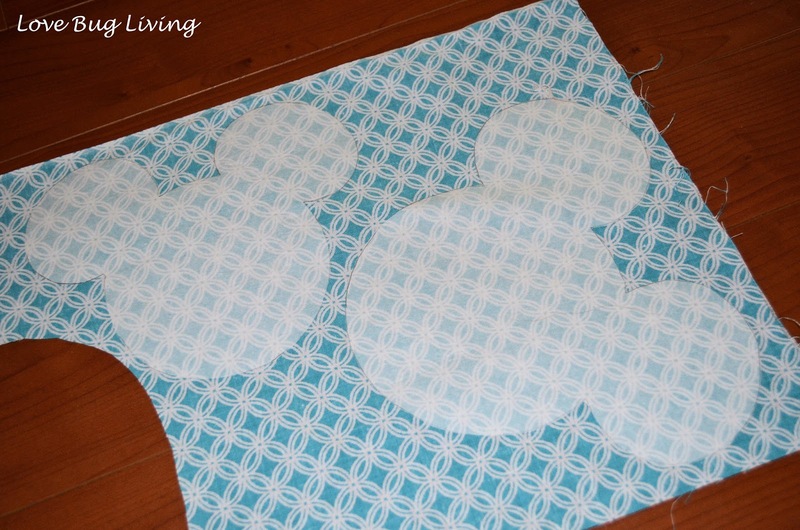 Once it was ironed on and in place, I zig zag stitched all the way around the edge. For my daughter's chorus concert, we found some plain mouse ears at our local costume store. They are much cheaper than Disney ones. I made a small fabric bow in matching material and attached it to the headband. It was the perfect finishing touch to wear to her concert performance.